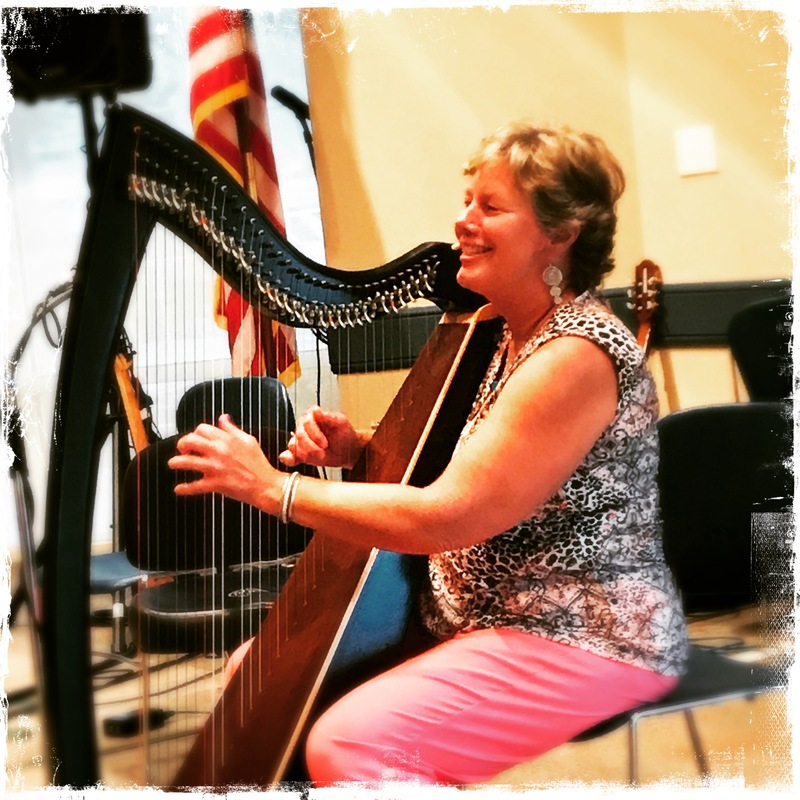 This month, my harp-roadie (hubby, Rick) and I did an epic harpmobile road-trip through the southern states. Our purpose was primarily for me to attend the New Orleans Jazz and Pop H arp Conference but we added on a few destinations before and after the gathering. When the tires made their final rotation of the trip into our garage we had gone 1,967 miles in Alora, my trusty harpmobile, and she performed admirably. 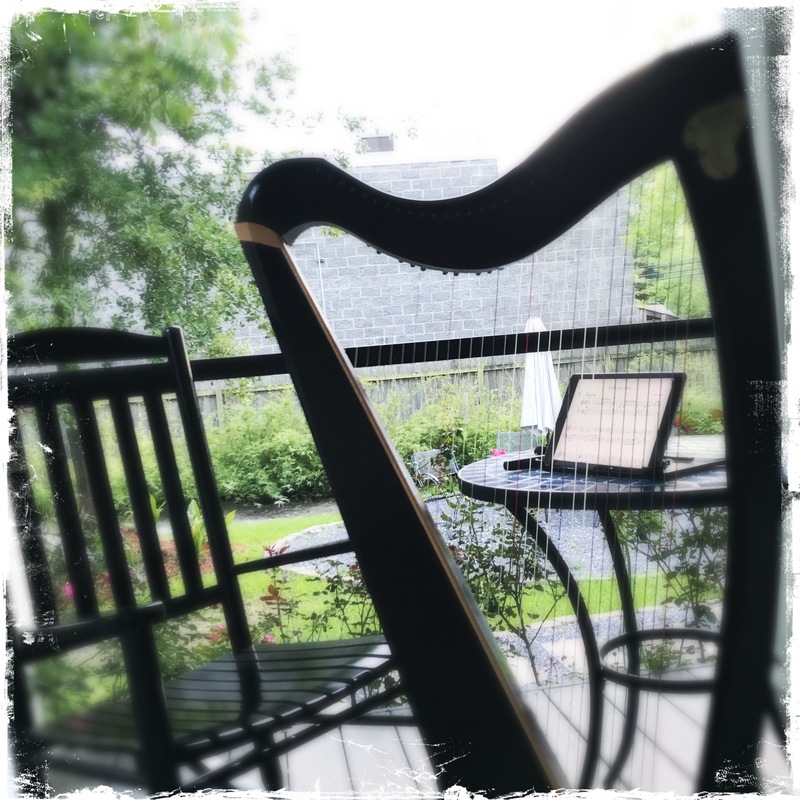 My black harp, Sabrina, was also along for the ride—well, of course, you have to have a harp to go with the harpmobile! And Sabrina really got the chance to perform because our dear pal and extraordinary harpist, Martha Gallagher, borrowed her (picture right) to use in the featured concert of the weekend. Wow! Martha sang and played after conference organizer, Patrice Fisher, and her group including her husband, Carlos, and all were top-notch. A large crowd gathered for the afternoon performance in the public library space and they gave a standing ovation when everyone finished. 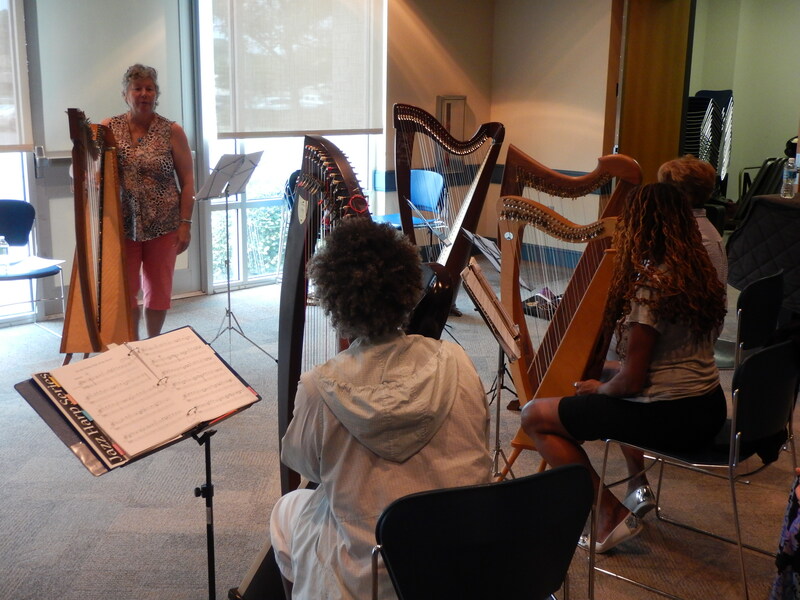 I was impressed by the number of people that came from the local community to see the harps in action. The concert sets were inspirational and the intimate class sizes that we enjoyed during the weekend were perfect. I attended classes by English harpist, Ben Creighton Griffiths on preparing a Jazz standard (Parts I and II), and an overview of electronics and amplification options for the harp. NOLA harpist Rachel Van Voorhees did classes on the chord structure of pop songs and adding musical pizzazz. Martha, who lives in upstate New York, taught classes on playing the blues and working with Jazz standard (photo below). AND I was able to visit with Martha for a while about the music project that I’m working on right now. That time was well spent and is going to pay off for me in a big way. Soon. Really soon. I’m working on it… I promise. During our lunch break each day, we set up harps in the coffee shop area that was part of the entrance to the library where we had our conference. People strolling in were greeted with music of all types and styles. We got lots of “I’ve never seen that” comments. I even had an opportunity to interact with a couple of kids. I played a few of their favorite songs for them and then they got to do their own mini-concert set. The smaller size of this conference was really a major benefit for attendees. I met several new harp friends and know that those are contacts I will cherish into the future. On Saturday night, eight of us met up in the New Orleans French Quarter for dinner. We had a jovial time telling stories and talking about music. Then on to the main attraction. We went to Snug Harbor Jazz Bistro to see some local musicians that Patrice and her husband know. The featured performer of the group was an older drummer who knocked all our socks off with his virtuosity. The best way to describe him is to say it was like watching a hummingbirds wings flapping at 4x fast forward speed. Yet, he never sounded rushed or unmusical. Oh, and the rest of the band wasn’t too bad either. Yeah, just world class. I was exhausted just listening to them. I loved that Snug Harbor is a serious music place despite the laidback café atmosphere. The ticket lady told us as we went in that there was no talking allowed during the performance and she was serious. I thought she was going to kick a couple of people out because they wouldn’t stop chatting. I’ll contrast with an experience in a Nashville bar a couple of nights later where the music was so loud you couldn’t hear yourself think but everyone was trying to yell above it nonetheless. There are all kinds of musical experiences to be had in the world. Hope you get to enjoy some summer music soon, too! An afternoon practice session in Mandeville, Louisiana.